Last Thursday Heather and Cloe from Cook School Scotland attended a Private Tuition lesson with Paul so they could teach how to decorate cupcakes at the Cook School. Paul is increasingly being asked for one to one, or in this case two to one tuition, as it allows the day to be tailored specifically for the students needs. Here Heater and Cloe set out the Cupcakes they wanted to learn and they all got cracking. There was a lot of laughing and fun and at the end of the day a box of 24 designer cupcakes to take home. Not sure if all 24 made it home as Cloe had her eye on the baby face cupcake she made. 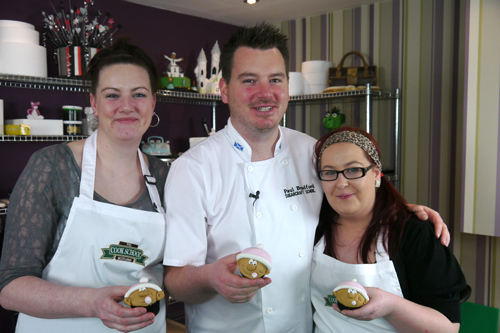 In the short video below Paul takes Cloe and Heather through making their favourite Cupcake design and having a bit of fun as they go.